OnePlus smartphones have already been considered as a flagship killer. With the launch of its latest Mclaren edition, it would be interesting to see whether the Huawei Mate 20 Pro will able to give OnePlus most expensive phone a tough competition? For the very first time, OnePlus has collaborated with the famous car manufacturer “Mclaren”. The latest OnePlus 6T is stylish in terms of design as it carries the same signature color, which Mclaren has been using in its cars for almost 20 years or more than that. It is also the first device that comes with 10GB RAM. However, the Lenovo is all set to launch its Z5 Pro GT, which will be the world’s first device to come with 12GB RAM. On the other hand, we have the Huawei Mate 20 Pro that has a triple camera set up at the back and is powered by Kirin 980 processor, which should be powerful. Let’s do a quick specs comparison first to know whether the device is enough to beat OnePlus 6T in terms of hardware at least on paper. Let’s begin with comparing these two devices in detail. The Huawei Mate 20 Pro sports a 6.39-inch display that offers a resolution of 1440 x 3120 pixels. On the other side, the OnePlus 6T Mclaren edition comes with a 6.4-inch display that offers a resolution of 1080 x 2340 pixels. 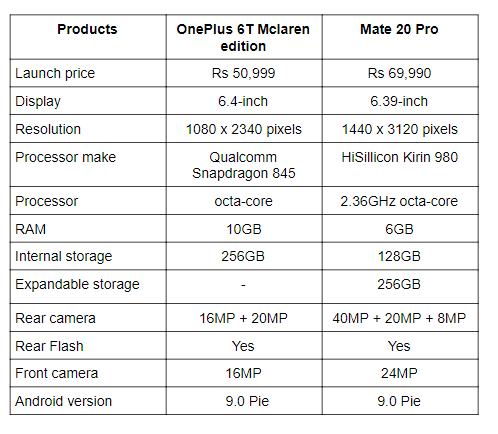 When it comes to the performance, the OnePlus 6T Mclaren edition is powered by the latest Qualcomm Snapdragon 845 processor, which is paired with 10GB RAM and 256GB internal memory, which is not expandable, while the Huawei Mate 20 Pro is powered by a Kirin 980 octa-core processor, which is clocked at 2.36GHz. The phone packs 6GB RAM and 128GB internal memory that is expandable to up to 256GB via a microSD card. As far as the cameras are concerned, the OnePlus 6T Mclaren edition has a dual camera set up at the back, same as the regular OnePlus 6T. It has 16MP + 20MP dual rear camera along with a 16MP unit on the front. On the other hand, the Huawei Mate 20 Pro comes with a triple 40MP + 20MP + 8MP rear cameras and 24MP sensor on the front. The OnePlus Mclaren edition box also contains a Warp charger 30, which according to the company can provide a full day battery in just 20 mins of charging. 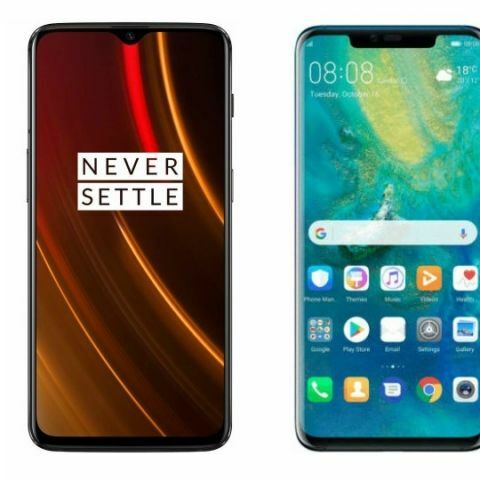 The OnePlus 6T Mclaren edition has been launched in India at a price of Rs 50,999, while you can get the Huawei Mate 20 Pro in India for Rs 69,990.